The new DAC, from a company best known for its Blu-ray players and headphones, has more to it than meets the eye. Now we are firmly in what is often referred to as the ‘computer music’ age, those who’ve made – or are thinking of making – the switch from physical formats such as CDs to files stored on a computer are likely to be looking for a means of making the connection between Mac or PC and audio system. The usual choice is a four-way one: you can use a digital-to-analogue converter (or DAC) with a USB input designed to connect directly the computer; you can buy a device able to play music from USB storage, which you load using the computer; you can stream directly from computer to a hi-fi device using a wireless system such as Bluetooth or Apple’s AirPlay; or you can make the content available on your home network and use a dedicated network player – if, that is, you can work out which model offers you the features you require. Or you can give up on the whole thing as too much faff and just content yourself with playing music from a streaming service such as Spotify or Tidal – and with that many options available, who would blame you? Chinese company Oppo thinks it may have the solution, which will come as no surprise to those who have followed its ever-expanding range. This is a company that started out making phones almost 20 years ago, but is perhaps best known outside its home country for its video disc players – first DVD and more recently Blu-ray – and, in recent years, a range of high-quality headphones and amplifiers to drive them. Its debut in the ‘personal audio’ market was the highly impressive PM-1 planar magnetic headphone model and the partnering HA-1 headphone amplifier/DAC, but for a while now its disc players have been known not just for their ‘universal’ capabilities, allowing them to play just about anything on a 12cm disc, but also for their superior video and audio quality, the latter even extending to built-in network streaming. With that context in mind, perhaps the new Sonica DAC, selling for £799, shouldn’t come as that much of a surprise. Here we have, packed into one relatively compact unit, a high-quality DAC able to play anything up to ultra-high-resolution PCM and DSD formats from a computer via USB; an Apple AirPlay/Bluetooth receiver for wireless connection of portable audio devices and computers; a player for music on USB storage devices such as hard drives and thumbdrives; and also a network player able to play music stored on home servers or computers, as well as internet radio or streaming services, with a choice of Wi-Fi or cabled networking. Oh, and it also has a built-in pre-amplifier feeding both conventional RCA phono outputs and balanced XLRs, and so can be used either directly into power amplifiers or powered/ active speakers or at fixed line level into a standard amplifier or pre-amp. As if that weren’t enough, it can also interface with the other products in the new Oppo Sonica line, which are wireless multiroom speakers will work with the Oppo for true minimalism speakers: via a dedicated app, available for both Android and iOS phones and tablets, the DAC can become another zone of a wireless music system or share music it’s playing with other Sonica zones. With all that functionality for the money, you might expect the audio side of things would be similarly functional but nothing more. However, experience of previous products from the company makes it clear that ‘adequate’ isn’t the Oppo way. Instead, the designers manage to combine topnotch components with good audio design practice, consistently making products that perform beyond their price, as is the case with both the Blu-ray players and the excellent HA-1 headphone amplifier. In this case, the design extends to the use of the highly respected ESS ES9038PRO 32-bit HyperStream DAC: the top model in the chip-maker’s Sabre Pro range, it allows the Sonica DAC to handle PCM up to 768kHz/32 bit and DSD up to 22.5792 MHz (DSD512) – at least via the asynchronous USB computer audio input, which allows the internal clock to take charge of the digital stream. In other words, the Sonica DAC is pretty much future-proofed in the digital formats department. Power for the unit is provided by a hefty toroidal transformer for low noise and minimal electrical interference, and the audio layout is fully balanced all the way from the output of the DAC through to the audio outputs, with the conventional unbalanced RCA phono outputs only being converted from this balanced feed at the last moment in the output stage. Again this is a noise-reduction strategy. 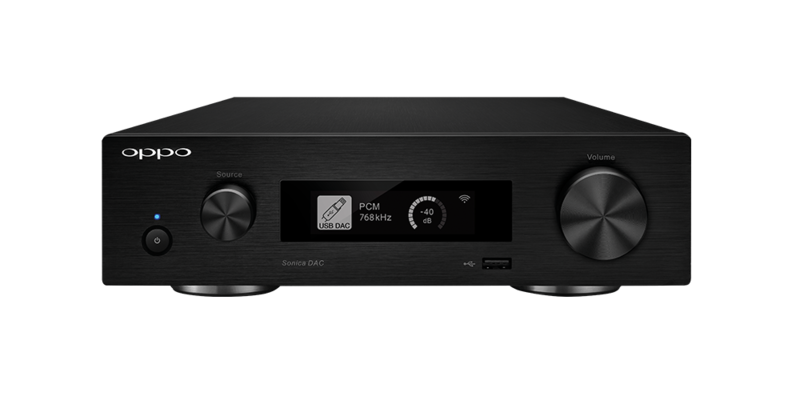 Aside from the wireless inputs – Wi-Fi, Bluetooth and Apple AirPlay – and its asynchronous USB connection for computers and USB host socket for storage devices, the Sonica DAC also has optical and coaxial digital inputs, and a single analogue input on RCA phonos. Using that last one, even an analogue source, including a turntable via a suitable phono pre-amp, can be digitised and shared with Sonica wireless speakers. Completing the connectivity are 12V trigger in/out sockets, for example to enable a suitable power amplifier to be switched on and off by the DAC. 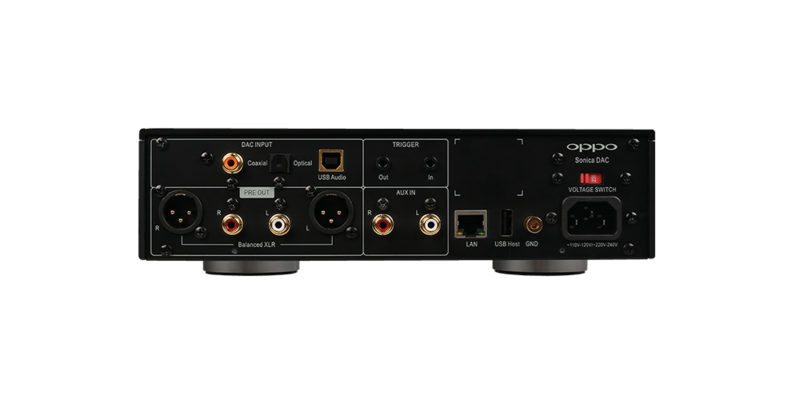 I remember being very pleasantly surprised by the performance of Oppo’s HA-1 headphone amplifier when used as a DAC/ pre-amp (7/14), so it should hardly be a surprise that the Sonica DAC, despite being less than two-thirds of the price of that unit, is an exceptional performer for the money. And that’s as true whether it’s used as a ‘computer DAC’ or a complete network audio solution: even when used straight into some very high-end power amplifiers I happened to have to hand during the review period it impressed with its clarity and power, not to mention the sheer detail resolution on offer.. Indeed, even when used in ‘Bypass’ mode, disabling the volume control to allow the Sonica to be used into a conventional amplifier, the unit more than justifies its price shorn of its pre-amp functionality. Yes, you need to have a phone or tablet to use it, but that’s the case with just about any network-capable player, and after all the entry-level for a suitable Android tablet is now comfortably under £100, even if you were to buy one purely to act as a remote control for the Oppo. Playing the Dudamel/Simón Bolívar SO recording of Beethoven’s Ninth in 96kHz/24 bit, fed from my MacMini, the Oppo displays excellent detail in a deep, expansive but well-focused sound stage: instrumental timbres are well resolved, as is the sense of the presence of the large orchestral forces, and even in the climactic last movement there’s still good insight into what’s going on, rather than simply a wash of sound, the headlong rush to the ‘finishing post’ showing the excellent rhythmic acuity on tap. Switch to the more relaxed, intimate recording of solo guitar works played by Roberto Moronn Pérez on his ‘Viva Segovia!’ album, released recently on the Fresh! label from Reference Recordings, and the crisp, precise presentation gives an almost luminous quality to the sound of the guitar, allowing the attack and decay of every note to be heard. It’s a wonderfully revealing sound, with fine body to the instrument and yet superb definition, and the Oppo is just as impressive with solo voices, chamber ensembles and across its range of inputs, so the same sound quality is maintained whether you are playing music straight from the computer or streaming it over the home network from a computer or NAS drive. The sum-up? The Sonica DAC is a remarkable device for the money, encompassing just about every computer music need in one simple package. Yet again Oppo shows it can take on the bestknown names in audio and come up with something special. For around £300 you can ind the Marantz NA6005, the company’s most affordable network player: it’s not in the irst lush of youth but has a lot to offer at this bargain price, and would be perfect for anyone wanting to dip a toe into streaming. More details at marantz.co.uk. The Cambridge CXN is part of the company’s ‘streamlined’ CX range, which is its mainstream audio line-up. In a more conventional ‘full-width’ package than the Oppo, not only can it play network and internet content but it also has an asynchronous USB input to allow a computer to be connected for direct playback. For details see cambridgeaudio.com. With its Uniti series, Naim was one of the irst companies to popularise the whole idea of music streamed over a home network. Since then it has developed its range of ND- network players for use in conventional systems. The NAC N 272 combines that expertise with the Salisbury company’s acclaimed pre-ampli ier technology to create a highly accomplished front end for a Naim system – not to mention keeping the box-count down. See naimaudio.com.